GrowJourney Note: We highly recommend this book for beginning gardeners, even if they aren’t homesteaders. Each topic clearly guides new gardeners through the available options & best techniques. Garden creation is presented in simple, chronological bite-sized projects complete with thrifty cost & time estimates. Best of all, this book teaches how to design using excellent modern information for successful organic gardening. GrowJourney Note: Contrary to what you might think, gardening doesn’t have to be hard work. We’re huge advocates (and practitioners) of no-till organic gardening, which means less work and better results when it’s done right. Learn the basics here. GrowJourney Note: Sure, we garden year round in South Carolina, but there are people in Maine and Canada that do as well. How? We give lots of tips and tricks throughout the GrowJourney blog, but Eliot Coleman (who lives in Maine) will give you all the info you need to garden year round in the coldest climate regions. GrowJourney Note: We love insects. We REALLY want you to love insects too. Why? It will make you a better organic gardener; help save bees, butterflies, and other pollinators from extinction; and it will awaken you to a whole new universe right outside your front door. If there is an insect in the US or Canada that is not in this incredibly comprehensive book (with photos, facts, and helpful info), we don’t know what it is. GrowJourney Note: Prepare to have your mind blown when you learn what’s happening in the soil under your feet. This book makes complicated soil science/microbiology accessible, fun, and useable for home-scale gardeners. GrowJourney Note: From the author of Teaming With Microbes, Teaming With Nutrients provides a rich understanding of what macro and micronutrients plants need to be healthy, and how you (an organic gardener) can get those to your plants. GrowJourney Note: The vast majority of plants on earth form symbiotic relationships with certain types of fungi to feed and protect themselves, in exchange for feeding the fungi carbohydrates they produce via photosynthesis. Understanding and nurturing these relationships is critical for being a good organic gardener. GrowJourney Note: An absolute classic for our fellow mycophiliacs (mushroom lovers). Learn about the incredible world of fungi from the world’s foremost expert, and how they can help us grow better gardens and even bioremediate nuclear waste! GrowJourney Note: Using good compost and compost teas is essential for being a good organic gardener since you can drastically cut/eliminate your need to fertilize & water, while boosting your plants’ biological immunity to a range of soil and foliar pathogens. Learn how to turn yard and kitchen waste into gold for your garden with this book. GrowJourney Note: Our friend Marie in New York City grows the most amazing, bountiful harvests on her tiny 66 square feet patio garden. She’s got a slightly larger garden space now, but this book is great reading for patio gardeners or those trying to figure out how to maximize their yields in a small space. GrowJourney Note: One of the most popular gardening books ever, this book will teach you valuable techniques for growing tons of produce in a small space using lots of innovative tricks and techniques. Especially helpful for patio gardeners and/or gardeners with small growing areas. GrowJourney Note: Beautiful edible landscapes don’t have to be large spaces. If you have a small garden, balcony, or patio that you want to convert to a beautiful edible space, this practical how-to guide will be required reading. GrowJourney Note: Another great patio/balcony garden book, this one gets especially creative with stylish cost-saving, DIY approaches to sourcing containers and water saving. If you want an eclectic, artistic look to your edible patio/porch garden on a minimal budget, this book will be extremely helpful. GrowJourney Note: How to get huge yields from small containers? Burrow down into the nitty gritty of organic container gardening in this book. Lots of useful info about selecting the right container sizes and shapes for your favorite fruits, veggies, and herbs – many of which people will tell you “can not be grown in pots” … they can! GrowJourney Note: Rows of corn and tomatoes don’t make a very visually attractive landscape. If you want to learn how to create a beautiful yard that’s also chock full of edible plants, this book by Edible Landscaping Guru, Rosalind Creasy, is a must-have. This is hands-down, our favorite edible landscaping book. GrowJourney Note: In our opinion, gardens shouldn’t be relegated to a hidden location in your backyard, they encompass our entire outdoor living spaces. Let’s make edible organic landscapes as normal in the future as chemically-intensive monoculture turf grass lawns are today. This book will help teach you how. 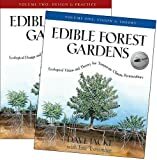 GrowJourney Note: We can’t get enough edible landscaping books, and if you feel the same way, we recommend you add this one to your collection. Filled with tons of helpful information and photos that will get your creative juices flowing. GrowJourney Note: One of the most informational and inspiring books you’ll ever read about plants, gardening, and life, this is our top recommended book for people who want an intro to permaculture. Toby Hemenway (who died in 2016) is a hero to us here at GrowJourney. A brilliant teacher, scholar, author, and permaculturalist. GrowJourney Note: What is the oldest and most productive method of food production on earth? Forest gardens, aka food forests. These intellectually and informationally dense books (think: textbooks) will impart an incredible amount of knowledge that will fundamentally change the way you view the world and design your edible living spaces. GrowJourney Note: Written by the legendary Sepp Holzer. If you have a larger growing area or small farm and you’re interested in converting it into a highly productive, profitable permaculture farm, this book will be equal parts inspirational and informational. GrowJourney Note: Our GrowGuides provide our members with the basic information they need to save seeds. If you want to take your seed saving knowledge and abilities to the next level, this comprehensive book by expert organic seed breeders will do the job. GrowJourney Note: The seed geeks dream book, this one will teach you how to save seeds from 160 different varieties. It also goes a step further with descriptions of flower structures, pollination details, required population sizes for good genetics, isolation distances, and more. GrowJourney Note: Got the hang of seed saving and want to start breeding your own original varieties? This is a great book to start with. Includes how-to’s and case studies on a wide variety of plants. GrowJourney Note: If you’re only going to get one seed breeding book, we’d recommend this one. We wish we could give it free to every GrowJourney member, and we wish every member would become a plant breeder, using the methods in this book that encourage breeding for plant performance/vigor under organic breeding approaches.